Each spring, the IIT community gathers outdoors for a supercharged send-off as Scarlet Hawk and other student-built high-performance hybrid vehicles roll out of Armour garage for a road trip to the New Hampshire Motor Speedway, where they vie against other college racecars in the annual Formula Hybrid™ International Competition. Jonathan Sibley (EE ’08), master’s degree candidate in electrical engineering and IIT Formula Hybrid project manager, helped to steer the efforts of the Wanger Institute for Sustainable Energy Research (WISER) Formula Hybrid team as they readied two vehicles for the competition, which was held May 4–6 in Loudon. Formula Hybrid™ builds on the Formula SAE® (Society of Automotive Engineers) prototype racecar design competition for college students. Under the guidance of Ali Emadi, Perlstein Professor of Electrical and Computer Engineering and director of the Electric Power and Power Electronics Center at IIT, the university was one of nine teams to participate in the inaugural Formula Hybrid™ competition, held in 2007. Coordinated by Dartmouth College Thayer School of Engineering, the competition is sponsored by the SAE and the Institute of Electrical and Electronics Engineers. Each year, more than 100 students from various academic disciplines participate in IIT’s Formula Hybrid team to design and build an open-wheel, single-seat plug-in hybrid racecar that both excels in the competition’s three events—acceleration, autocross, and endurance—and feasibly serves as a manufacturing prototype. While the car must conform to a formula that specifies, for example, the materials that can be used for the frame or the maximum length of the wheelbase, and that emphasizes drive train innovation and fuel efficiency, creativity is strongly encouraged. 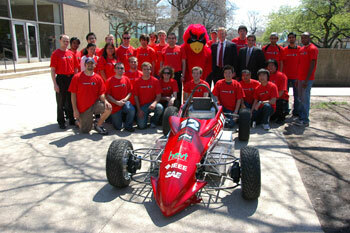 IIT students incorporated several new features in Hammer Hawk, the team’s latest vehicle. Among them are a parallel arrangement of lithium-iron phosphate batteries and ultracapacitor packs (devices that store and release energy very rapidly), four-wheel regenerative braking, and a student-designed and fabricated planetary gearbox. A six-speed pneumatically-actuated and computer-controlled transmission that reduces motor speed while increasing torque output at the wheels, the gearbox drives the wheels at the proper speed and allows for greater acceleration—to the tune of 0 to 60 miles per hour in just under four seconds, according to Sibley. “That’s faster than a lot of Porsches,” he says. While IIT team members are relatively new to the racing scene as compared to students at schools with decades of Formula SAE experience, Sibley notes that the learning opportunity is invaluable, especially working with a mentor who is considered a leading expert in electric-drive and hybrid-electric vehicles. “Where we may lack in mechanical and fabrication experience, we really make up for it by having access to front-running technology and ideas through Dr. Emadi,” he says of his professor, who was recently honored by Chicago Public Radio for helping to make Chicago a center for hybrid technology research, development, and application.